Specifically the Console panel has seen a number of security improvements. We’ll be discussing the specific nature of these changes once everyone has had enough time to upgrade to Firebug 1.2. A list of all the bug fixes can be found in the full release notes. Taking in to consideration the above performance points (namely the fact that enabling the Console, Script, or Net panels have the potential to incur a global overhead on all browser tabs) a feature was added to help you minimize your use of the panels in errant tabs. If you position your mouse over the Firebug icon, in the Firefox tray, a tooltip will pop up telling you two things: The version of Firebug that you’re using and which tabs have some Firebug panels enabled in them. 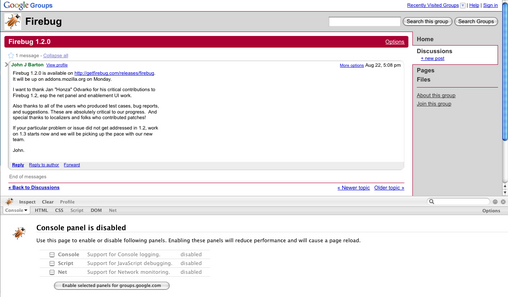 It should be noted that the Firebug will be a gray color if no tabs currently have a Firebug panel enabled at all. Using the above tooltip you can now go in and selectively disable any panel usage that you are no longer utilizing. Of course, when using the above tooltip (or seeing that the Firebug icon is lit up), you’ll just want to suspend all use of Firebug panels straight out without having to poke-around each individual tab. A new Suspend/Resume menu option has been added that will suspend/resume all active panels. This is a one-click way to keep Firebug in check. Thank you, Firebug, for the much-needed Suspend/Resume. I may be mistaken, but the last sentence seems extraneous. I was used to work with Firebug 1.2 beta and all worked fine, but I have some big trubles with the 1.2 final release : when I use Firebug, some styles are overwritten and lost, even in FF other tabs. The only way to go on is to restart FF. One of my collegues experience the same. Using FF3 and FB 1.2, when debugging a multi-thousand line Ajax library (any of them will do, they are all large) it takes between 5 and 10 seconds to STEP. On FF2 and FB1.1 it was instantaneous.